In this guide I will try to explain my trade tricks and strategies to help people who is not using trade market or aware of it's massive advantages. Let's begin! 1. When you select your country. Go directly into market panel and buy everything below 6.5, and all of rare materials (price limit doesn't apply for rare materials). 2. Put buy offers from 3 or .1 higher than the highest offer. 3. 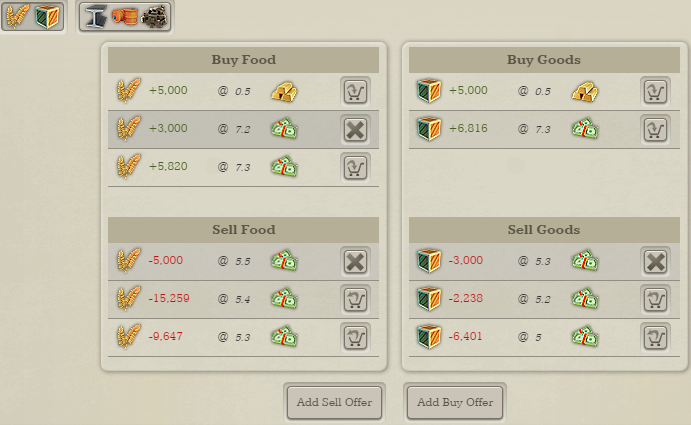 Do the same for sell offers in the opposite way. 5.a. Of course after some time you will eventually lose the control due to possible competitor or lack of activity and control (you have to sleep anyway) but until then you will be a millionare. Conclusion: If you can do this, you will be the wealthiest person especially in the early game. That will make a huge difference later on. And now let the pictures speak! The post was edited 1 time, last by HMS Surprise ( Sep 25th 2018, 2:04am ). Manipulating the market in the early stages would be hard since you don't have much money to begin with. Maybe after a few days it can work. Goods are the most wanted items, so if you're abundant on goods, put as expensive as a price u want. I agree about the goods. But I don't agree on waiting few days to work it. Because it works best on the day 1. You can sell your rare for even 60 and buy for even 3. Actively manipulating rare materials market will also quickly fill your coffers. Eventually, your money would run out, and you probably have to sell stuff. You can put it at a high price, but if there's a cheaper choice, then you can't really gain any money.